Have removed the fleece from over the potatoes. If it does frost between now and the end of the month, will have to recover. Above is the one mound of red duke of york, These are first earlies, so could be up as early as next month. They have been in for about eight to nine weeks, I think. I had been expected a few more clumps of leafy foliage. I can’t imagine that the other two mounds so expertly sunk by the artist in residence will have failed. He’ll be gutted if they have! We want a success, so A)he comes back again B) he sees that his handiwork paid off. I do want to see the red potatoes come out, they are being played with this year, for the very first time. 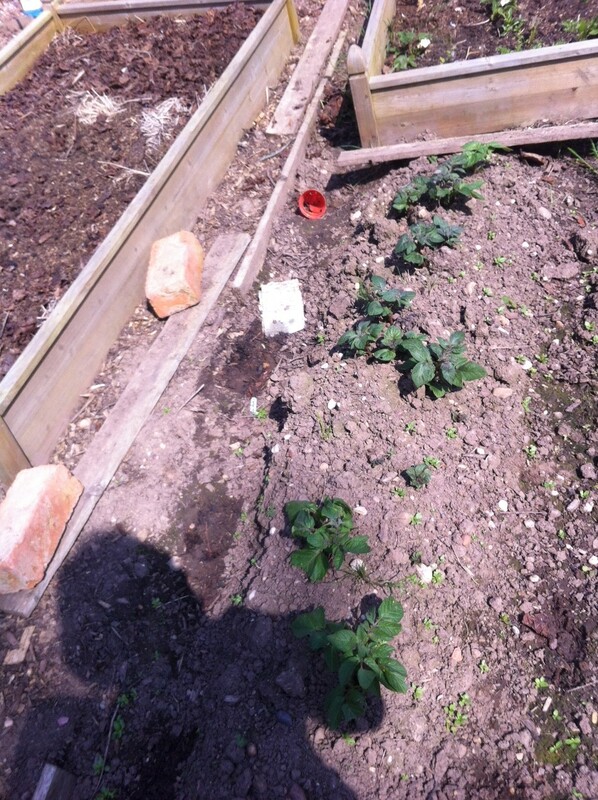 The vast majority of the other spuds are up. Am yet to see any Maris Piper though. Lady balfour, international kidney and King Edwards, have certainly sent up green leafy shoots. I can only imagine that the seed potatoes are perhaps struggling to grow through the heavy clay. The very name of international kidney makes me laugh. These were not planted in trenches, but sunk with a bulb planter. So it will be interesting to see how these will progress.